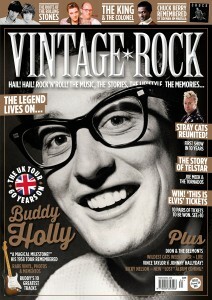 This issue of Vintage Rock takes an in-depth look at one of the all-time legends of rock’n’roll, Buddy Holly. When Buddy Holly And The Crickets arrived in London on 28 February 1958, they were already rising fast. But they surely didn’t realise just how much impact they would have on British music over the following month. We look in detail at that groundbreaking March 1958 tour – our cover shot was even taken on the very day Holly first set foot on UK soil – plus we dig deep into some rare Holly memorabilia, and argue the case for Buddy’s 10 greatest tracks of his brief but shining career. Despite his short time on this planet, Buddy Holly really did leave a stellar legacy. Relive it all in over 20 pages of celebratory pages in this issue. Elsewhere, we launch into space with the crazy story of the still-remarkable Telstar – masterminded by the mercurial Joe Meek, recorded by the volatile Tornados – and look at the raw roots of the early 60s Rolling Stones. Plus, as rock’n’roll is truly as much about about the characters as it is the music, we hear exclusive insider tales of the Elvis Empire from Col Tom Parker and Elvis assistants Greg McDonald and Charles Stone – from selling ‘I Hate Elvis’ badges to The King’s shopping trip for 12 TVs, it is an enchanting exposé on both Elvis himself and “the devil” who managed him, Colonel Tom Parker. Has Parker actually been misunderstood all these years? Read on, and you decide! And don’t miss your chance to win tickets to see the spectacular This Is Elvis! Show touring the UK this spring and summer. It’s a bumper issue of Vintage Rock we’re proud of – we hope you like it too.